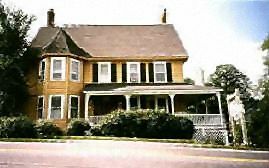 The Carriage House of Woodstock offers comfortable accommodations just one mile west of the village of Woodstock, Vermont, one of New England s premier tourist destinations. Eight rooms are uniquely furnished with a queen bed and private bath (some have whirlpool tubs and cable TV). An additional room has a king size bed, fireplace, TV/VCR and whirlpool tub. All rooms have individual heat/air conditioning. A full breakfast (featuring homemade muffins, fresh fruit and a hot entrée) plus an afternoon snack are included in the room rates. The Carriage House is only a couple of minutes from lots of shopping, galleries, fine restaurants, museums, and lots of outdoor activities (skiing, hiking, fishing, golfing and more). This and other Vermont Bed and Breakfast Inns can be found here online in The Register.